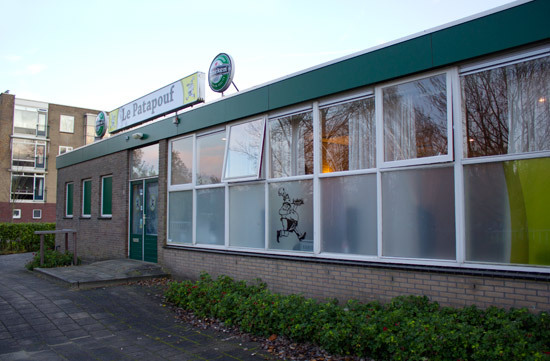 Location: Le Patapouf, 1-3 Kolkmanstraat, Gouda, The Netherlands. 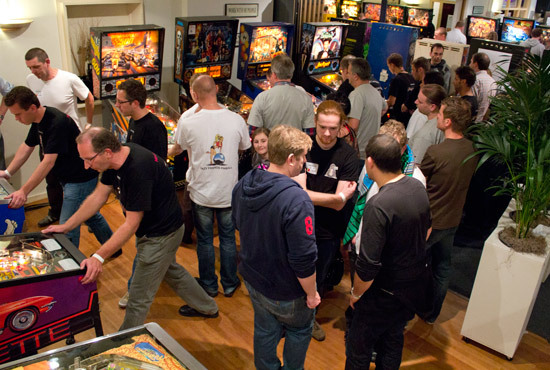 After last year's event in the north of the country, this year's Dutch Pinball Open headed south to the city of Gouda and Le Patapouf party centre. Entry to the venue cost €10 ($13.75) for the Saturday, €7.50 ($10.30) for Sunday or €15 for the two days. 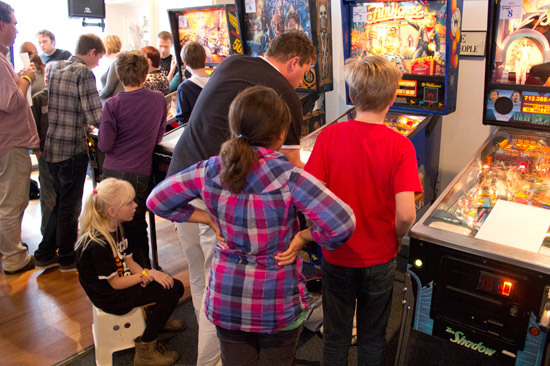 Those were the prices for members of the Dutch Pinball Association (NFV) and overseas visitors. For everyone else, entry was another €5 per day. In addition, most of the adult tournaments being held across the weekend had its own entry fee. 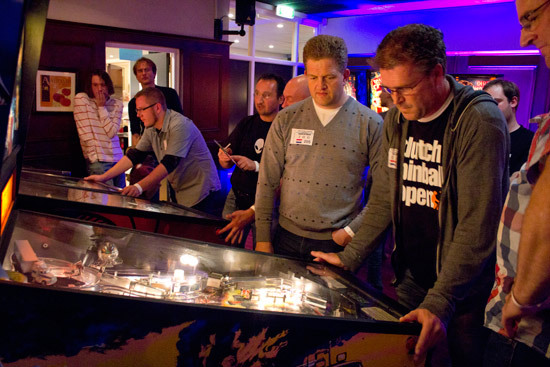 The Dutch Pinball Open cost €17.50 per person, the Team Tournament was €25 per team of four and the Ladies Tournament €7.50. There was also a Junior Tournament, although that was free with show entry. At the entry desk, visitors could buy assorted NFV souvenirs and pinball items such as manuals, postcards, licence plate holders, stickers, printed canvases and framed posters. Behind the desk on the window sill were the trophies up for grabs over the two days. At the end of the entry desk was the newest game at the event, a Stern Tron Pro. 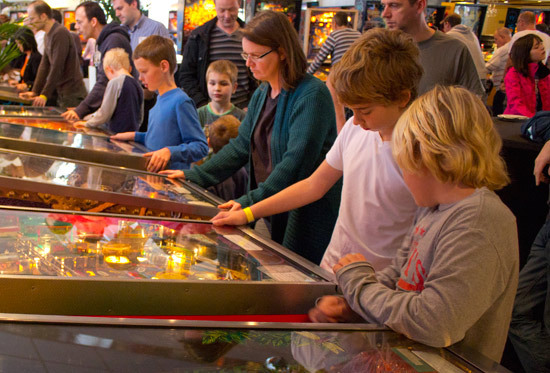 Like all the non-tournament games it was set to free play, but play was restricted to one game at a time, with the start button remote controlled from the entry desk on request. 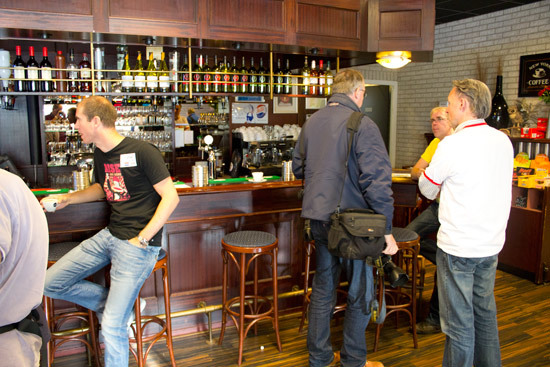 Opposite the entry desk was the bar, where hot and cold drinks could be bought, together with hot food such as burgers, fries, bread rolls with ham, cheese or smoked sausage, rolls, meatballs and mixed hors d'oeurvs. Sodas and Heineken beer were €2, wine was €3, hamburgers were €2.50 and french fries €2, with purchases being made with tokens which could be bought at the entry desk (presumably due to some licensing restrictions on paying directly in cash). 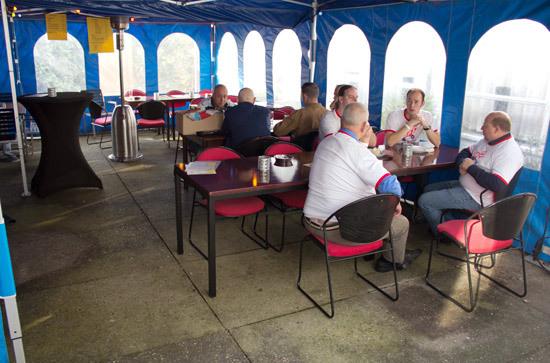 For those who like to smoke, an outdoors covered and heated seating area was available. But what of the games and the competitions I hear you ask. Well, there were plenty of both, so let's start with the games. 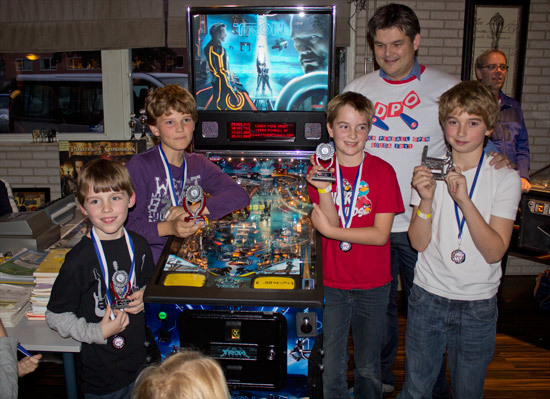 There were 53 games in the free play area, 6 in the Classics Tournament section and another 19 in the DPO tournament room. 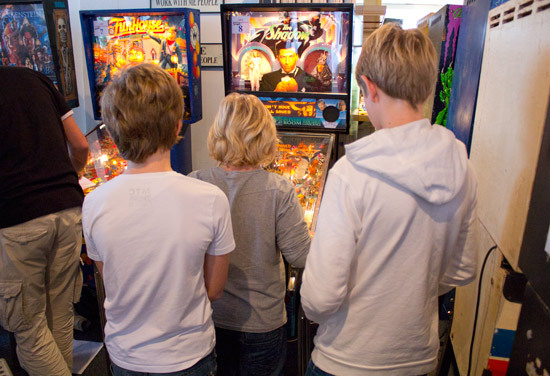 Some of the time, a section of the free play area was dedicated to one of the side tournaments - the Country Tournament, the Ladies Tournament or the Junior Tournament - but the rest of the time these games were available to play. The entrance to the free play area was flanked by a Demolition Man and a Gilligan's Island. Both had some unusual features. 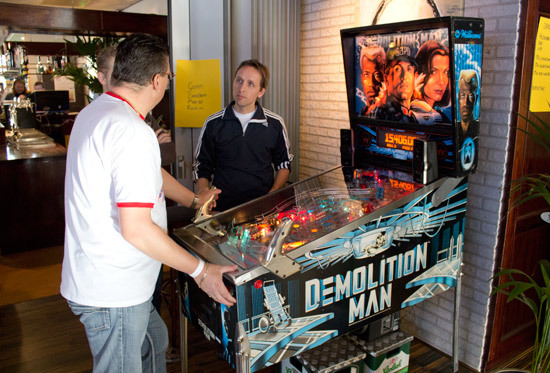 While the Gilligan's Island had the flipper buttons reversed, the Demolition Man was fitted with a P-ROC board and running custom software from Dennis van de Pas and Robin van Beijnum. The game was only at the show on Saturday, but visitors got the chance to try out the completely new set of rules, display animations and sounds Robin and Dennis had created. Once visitors passed these games they were into the main part of the free play area. 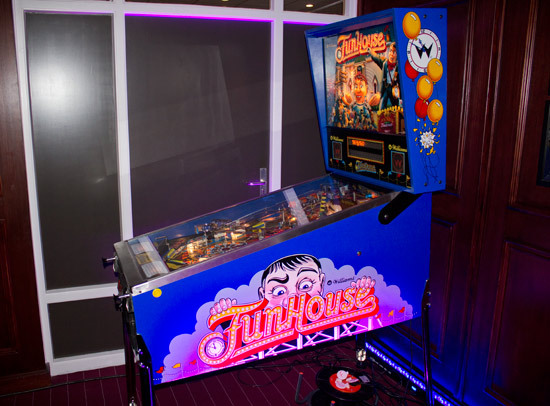 The first bank of games includes some rarities such as Bone Busters Inc by Premier and Gottlieb Circus. The free play area was a 'T' shaped room with pins all around the outer walls. The picture below was taken from the stem looking at the arm of the 'T'. 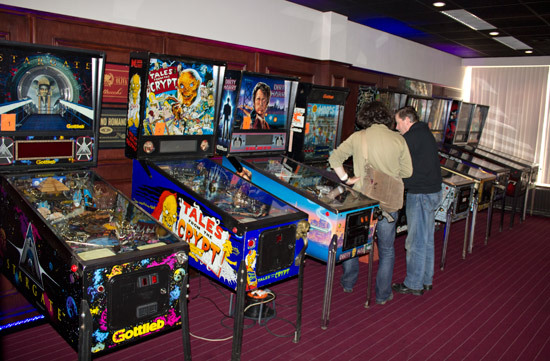 On the opposite wall were Back to the Future and a whole bunch of dot matrix games, such as Creature from the Black Lagoon, Tommy and Bran Stoker's Dracula. Probably more than at any other major tournament, there was a healthy number of women and children enjoying the machines. 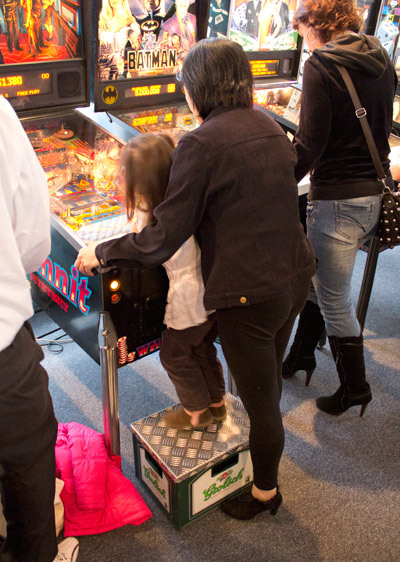 Even those who couldn't reach the flipper buttons got a helping hand or two. The youngsters would later get the chance to play in their own tournament. 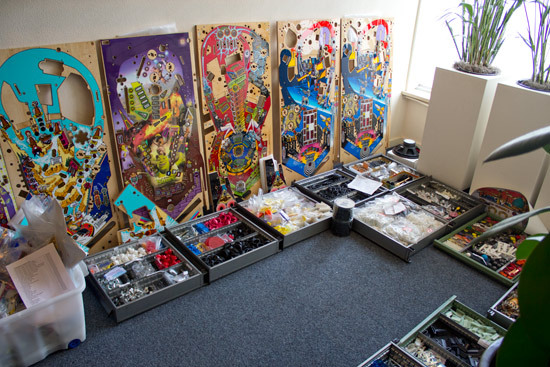 In a side room, Saturday's visitors could buy from a wide range of pinball parts brought by Mirco Steffen's High Class Pinballs. 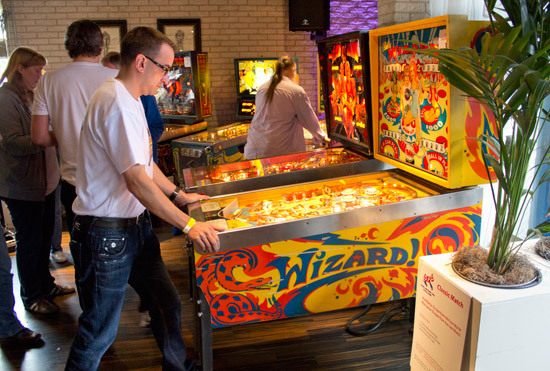 High Class Pinballs are based in Hannover, Germany, but usually travel to the Dutch Pinball Open, wherever it may be held that year. They were only set up for Saturday afternoon, but brought some very attractive looking playfields and many different parts and assemblies. And so we come to the competitive side of the DPO and the main reason most of the visitors made the journey to Gouda this weekend. 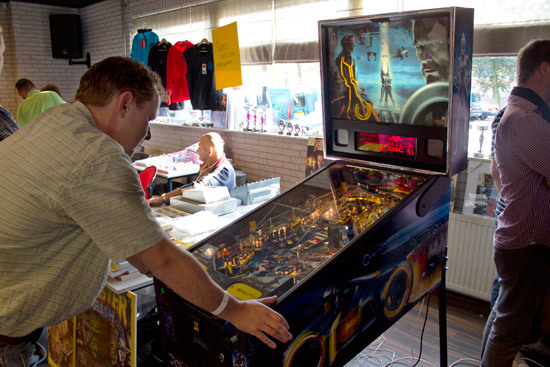 The Dutch Pinball Open was held in a room behind the bar and it was here that 19 machines were set up for the qualifying and play-off rounds of the tournament. Additionally, there was one mystery machine, wrapped up and located at the end of the row above. We'll come to that one shortly. 145 competitors took part in the DPO and for most of them, their first task was to survive the qualifying round. Qualifying was split into two groups, the first was exclusively for players in the afternoon's Country Tournament, and game those players an early session to record their scores. Everyone else could start their games after 3pm and qualifying continued until 9pm when the final list of qualifiers and non-qualifying positions could be published. 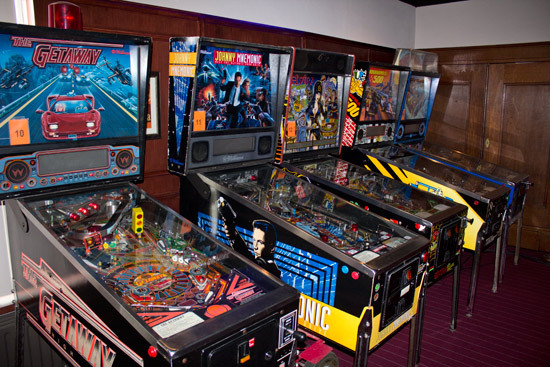 Players in the DPO got to choose 6 of the 19 machines and played a single 4-ball game on each of the 6. 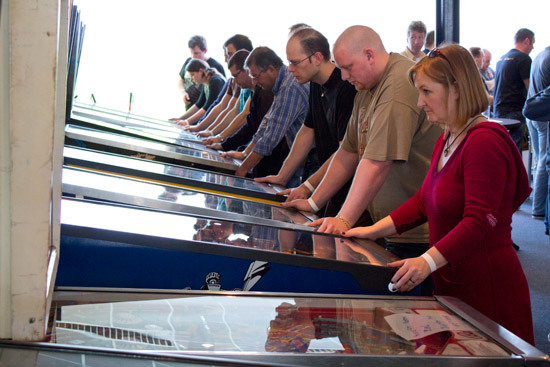 Scores were recorded on paper after each game and all the scores on each machine were ranked. The DPO also gave players a 'joker' which they could use to replay one of their six games if they had a bad score. Players chose which of their games to replay, and if their joker game score was higher than their original score, their joker score was recorded instead. If the joker game wasn't an improvement, they kept their original score. This is the same system used at the EPC when it was held in the UK and like then, the joker proved a huge bonus to some players and made the difference between qualifying and not qualifying. 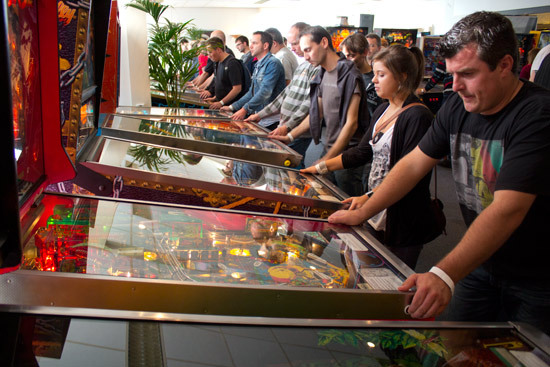 The top 30 scores on each machine earned the players ranking points, ranging from 50 points for the top score to 1 point for 30th best score. Points were more widely spaced at the top of the table - with 46 points for second place and 42 for third - and closely bunched at the bottom of the points. Only 40 of the 145 competitors would survive the qualifying to play in Sunday's head-to-head rounds. The overall skill level was pretty high with few casual players taking part, leading to frustrations in the heat of the small room as competitors saw their chance of qualifying slipping away. 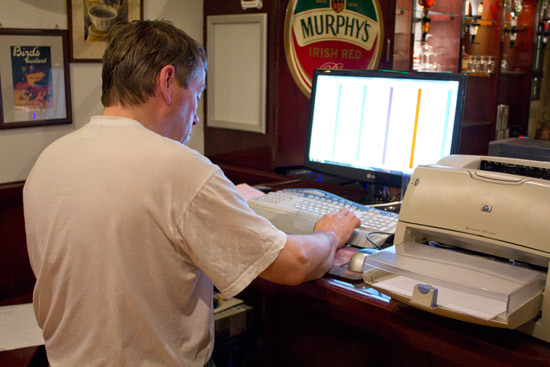 Throughout the day, as scores were written down they were passed to the tournament desk just outside the room and entered into the computer system. This was linked to a 42" LED screen just around the corner where players could see the top scores 9 scores on each machine and the lowest ranking points-scoring score (30th place). In addition, an overall ranking table showed the top 49 players and the 40 of those who were currently in qualifying positions. 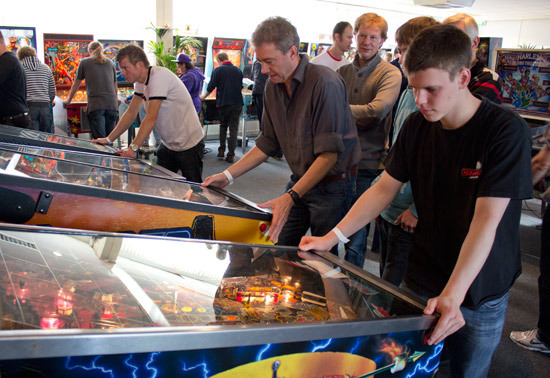 The position of the screen led to a large crush of people at times, as groups of players checked their scores, others tried to get into, or out of, the tournament room, while right behind them others were trying to play machines which were also set up in the area. This was also where the tournament desk was situated, where Tournament Director Ad Jonker and his assistants entered the scores. Top qualifier Daniele Celestino Acciari's score of 278 points was only 22 points short of a perfect 300 points. 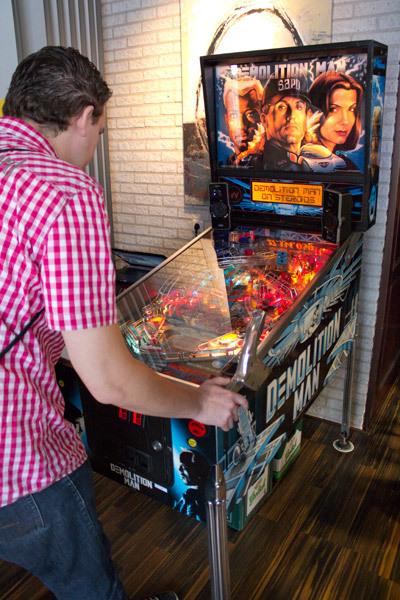 He achieved the top score on 4 of his 6 machines - Johnny Mnemonic, Monster Bash, Junkyard and F-14 Tomcat. For Sunday's rounds, those 40 players were joined by 8 pre-qualified NFV members who won their places by winning regional tournaments across The Netherlands. That meant those who didn't qualify were bumped down by those 8 places, plus one more for last year's winner Paul Jongma who also qualified as a result of winning in 2010. The format for Sunday was head-to-head, best-of-three 3-ball games on machines drawn at random in a double-elimination format. The top 16 qualifiers received a bye through the first round, leaving 32 players in the 16 matches of the first round. The 16 winners then met the top 16 qualifiers in more head-to-head matches, while the 16 losers went into the loser bracket to play a sudden-death 4-ball game for the chance to continue in the tournament. Anyone who lost in the loser bracket was out of the DPO and locked in their finishing position at that point. The winners of each round continued through all six play-off rounds before there was just one left who had won all his games and went into the final. No great surprises that it was Daniele Celestino Acciari who remained undefeated and took one half of the final pairing. Third-placed qualifier Erwin Deutschlander had also remained undefeated until the semi-finals where he lost to Daniele. He joined the loser bracket and played David Gremillet for a chance to return to the final and won, meaning he would face Daniele again in the final. So at 5:30pm, Erwin and Daniele entered the finals room, both having chosen one of the machines to be used, with the third drawn at random. Erwin chose Dirty Harry - a game he had won on earlier in the day - while Daniele chose Whitewater - which he had played three times already on Sunday. The third machine was The Sopranos. Before the final began, however, there was a moment of reflection. 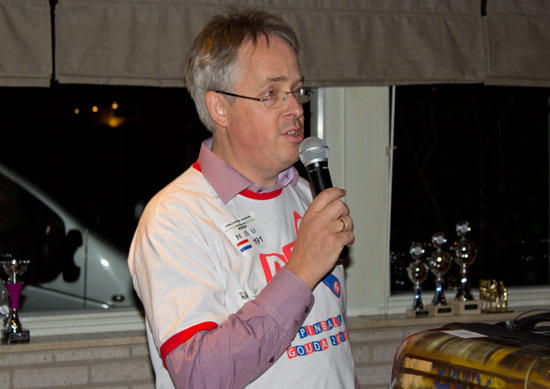 The organiser behind holding the DPO in Gouda, who arranged the venue and the logistics, was Bert-Jan Brinkhuis. 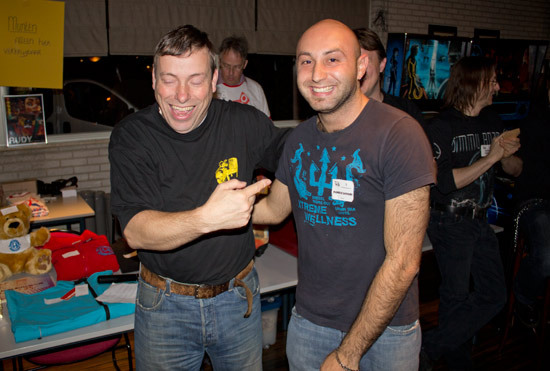 Several months before the DPO, Bert-Jan died unexpectedly. As a mark of respect, Bert-Jan's Funhouse had been brought to the show and was the mystery machine under wraps on Saturday. It had been brought into use for Sunday's playoff rounds and now, just before the tournament climax, the two finalists joined together to play a single ball of split-flipper play on Bert-Jan's machine. After the fun of playing Funhouse, it was down to the more serious business of the final. 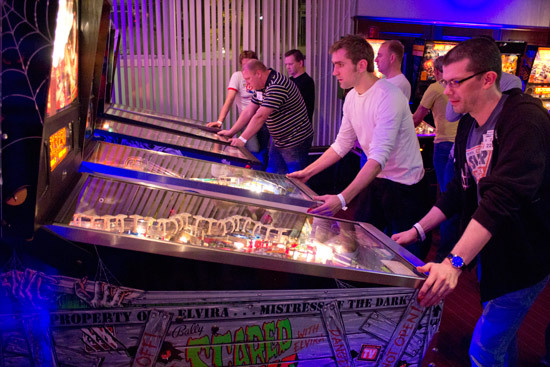 Each player went first on their chosen machine, so Erwin started the final on Dirty Harry. Erwin started with an OK first ball, but Daniele romped away with 1 billion points on both his first two balls. When Erwin ended his third ball on 1.5 billion, Danielle had already won and didn't need to play his third ball. Play moved on to Daniele's chosen machine, Whitewater, and while he may have chosen it, he didn't get off to a good start with just 9 million on ball one. Erwin took advantage and racked up 183 million with his first ball. But Daniele get into his stride with ball two, starting 5X scoring and then multiball, to collect several 5X jackpots followed by double jackpots to give him a ball 2 total of 555 million. In reply, Erwin got to Wet Willies and scored a total of 331 million by the end of his second ball. 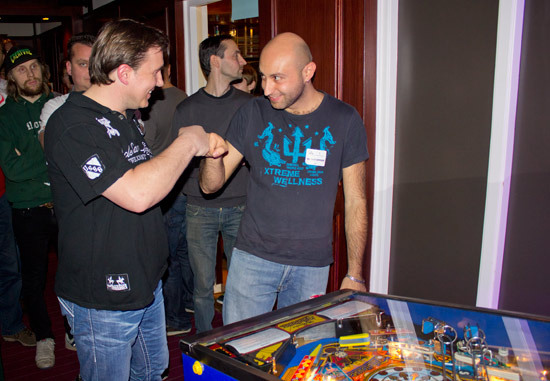 Daniele only boosted his score slightly with his final ball, ending on 595 million. Erwin needed to score 265 million with his final ball to take the match to a third game, but he suffered a nasty bounce and tilted trying to save the ball having added just 1 million. 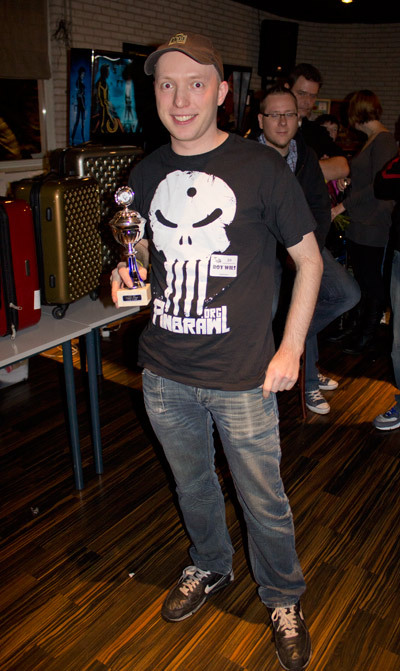 So Daniele Celestino Acciari won the Dutch Pinball Open 2011, two games to nil. Straight after the final, the presentations were made for the DPO and the other tournaments held over the weekend. Before we get to the presentations, let's have a look at those other tournaments. The teams were split into two groups and played a best-of-three match against the other four teams in the group. The top two teams from each group then went into the semi-finals. 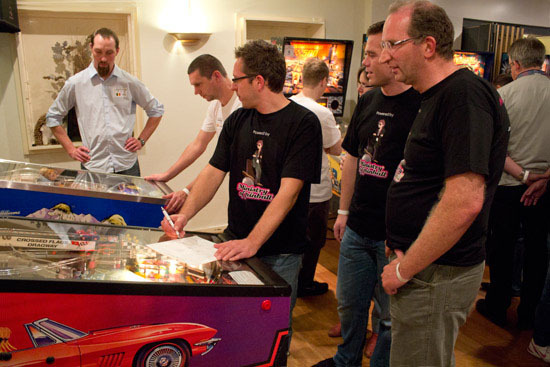 The two semi-finals pitched the Amsterdam Pinball Team against Team BAF, and Attack from France against Crazy Friends Pinball. The Amsterdam Team won their semi-final, as did the Crazy Friends to go into the final, while the two losing teams played off for third place, with Team BAF ending up third and Attack from France in fourth. 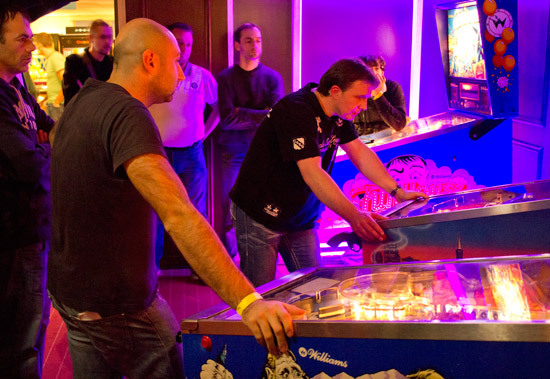 The final went late into the night (well, too late for us anyway) but the result saw a new name on the list of winners, as the Crazy Friends Pinball team of Yan Baratte, Axel Bouet, Sylvain Grévin and Michel Dailly triumphed, leaving the Amsterdam Pinball Team in second place. In addition to Saturday's Country Tournament, there were also tournaments on Sunday at 1pm for ladies and kids. Unfortunately, due to being busy taking part in the DPO, we were unable to get any pictures of the Ladies, but it was held on the same machines used for the Country Tournament the previous day and the eventual winner was top-qualifier Helen de Haan who beat Nynke Hepkema into second place, with Sandra van Hees in third and Machteld Decloedt fourth. A little later, the Junior Tournament reached its conclusion. As soon as the outcome of the Junior Tournament had been decided, the presentation of trophies was made. 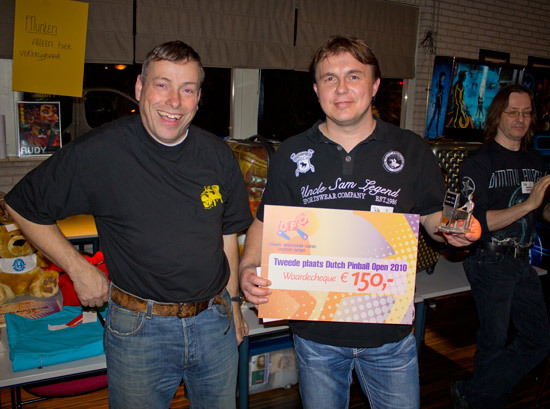 In the final it was victory for Yoeri van de Sanden. 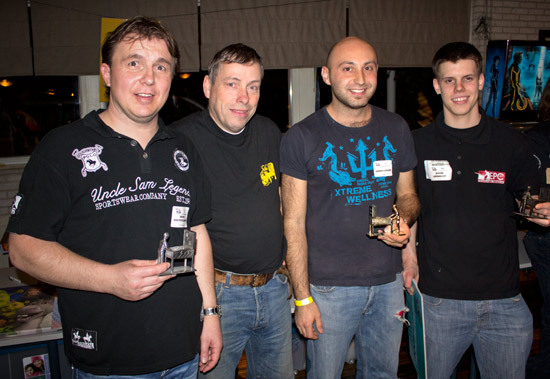 Second place went to Mart Oenema with Tom Vis in third place and Arthur Vissers in fourth. There was also a Classics Tournament which began on Saturday morning and continued until 5pm on Sunday. Six electro-mechanical or solid-state machines were set up in a corner at the end of the registration desk and competitors could choose any three to form their entry. Players could enter as many times as they liked with each €3 entry adding another discrete group of three machine scores. 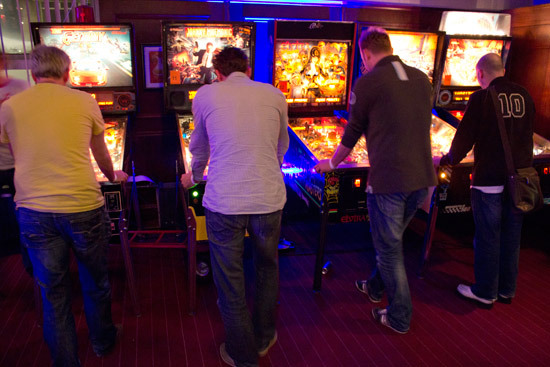 All the scores on each machine were ranked and the player with the best scoring entry was the winner. 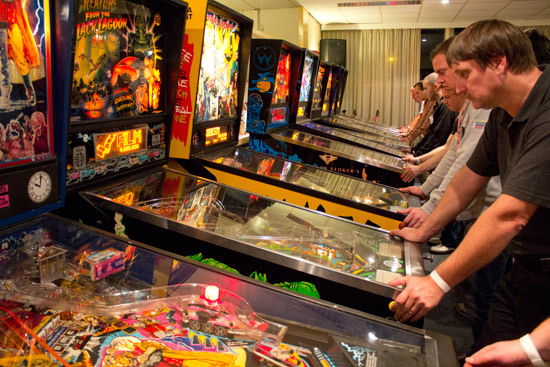 The machines were tightly packed into the corner of the room which sometimes made it difficult for spectators or those waiting for a game to find somewhere to stand without getting in the way. 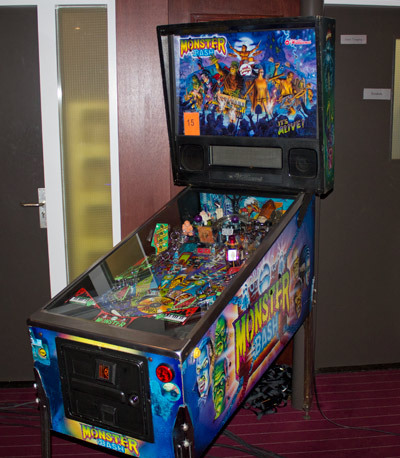 The top prize for winning the Classics Tournament was the Bally Escape from the Lost World which was on the floor in the free play area. So now we come to the presentations for the tournament winners, who were introduced by the NFV's Bas Vis. 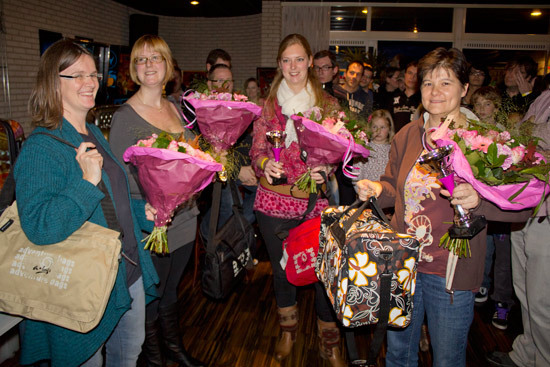 After thanking the DPO organisers who took over the reins after the death of Bert-Jan Brinkhuis, the first winners to be presented with their awards were from the Ladies Tournament. We're awaiting the full results in the Ladies Tournament, and will bring them to you just as soon as we receive them. Next came the Country Tournament winners. 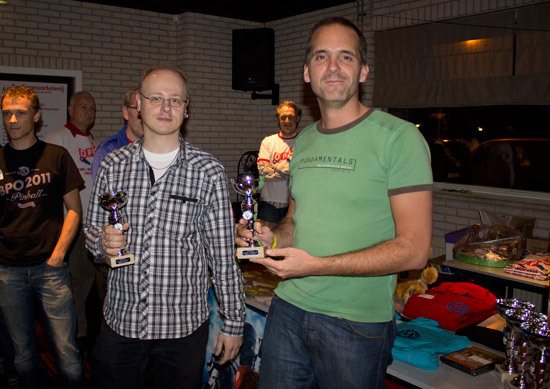 As the event was held the previous evening, not all players could stay until the prize-giving ceremony, but two members of the runners-up, the Amsterdam Pinball Team were there to receive their trophies. 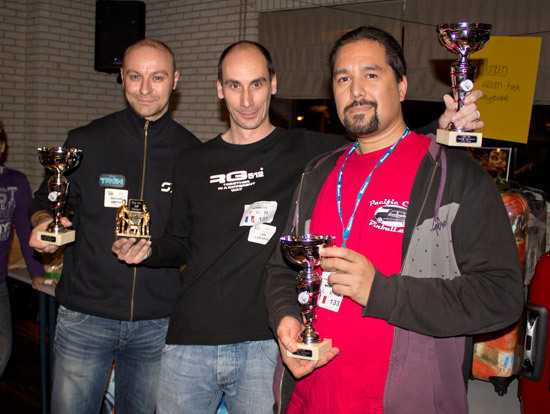 Three of the four members from the French winning team Crazy Friends Pinball were also able to collect their winners' trophies. The fourth team member was Axel Bouet who couldn't stay for the presentation. 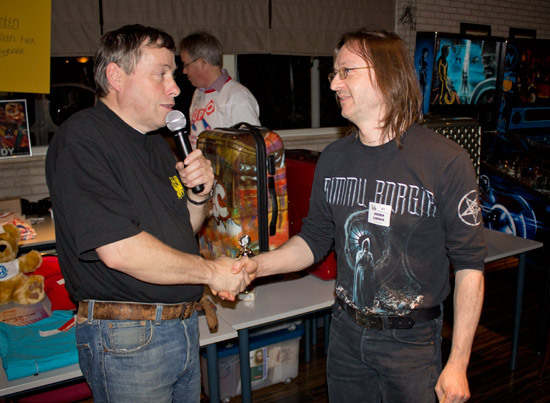 Then came the announcement of the winner in the Classics Tournament. 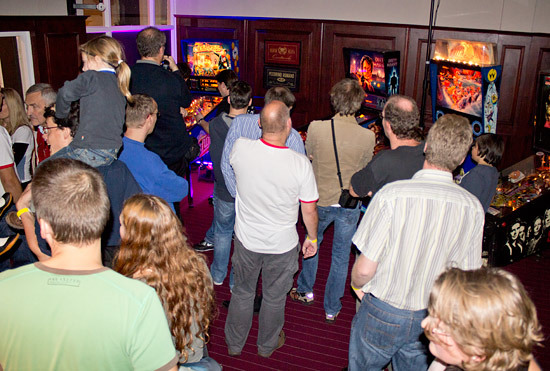 There was no big screen to show the current standings, so the full results were not available at the time, but the winner was Roy Wils who took home a trophy and the Bally Escape from the Lost World machine. 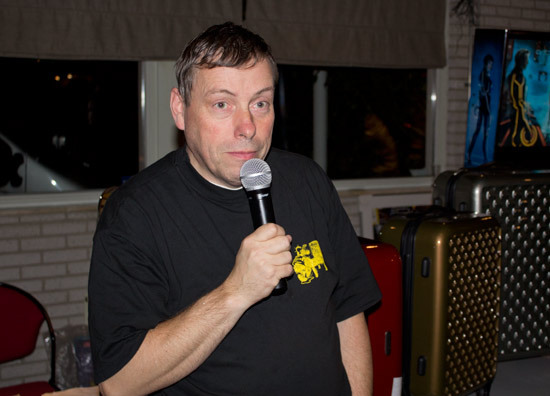 The final awards were given to the top players in the main DPO tournament, and organiser Ad Jonker made the announcements and presentations. 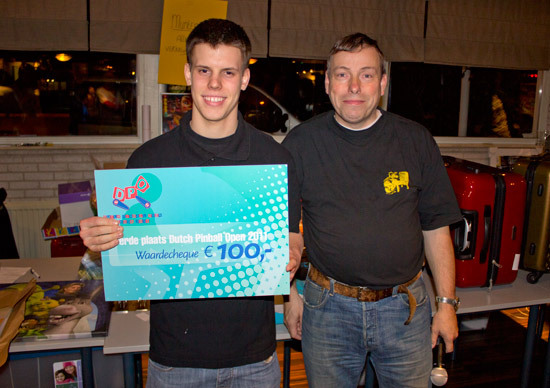 Daniele also won a cash prize of €350 for his victory along with a gold statue. Finally, the draw took place for the raffle prizes. Tickets for the raffle cost €3.50 each, or 3 tickets for €10, 5 tickets for €15 or 20 tickets for €50. Prizes included a Shrek translite on canvas, a fleece jacket, DVDs, pinballs, LEDs and for one lucky winner, the grand prize of a Bram Stoker's Dracula machine. The DPO continues to be one of Europe's most popular tournaments. The NFV team once again put on a well-run and well-attended event, with five tournaments taking place over the two days. 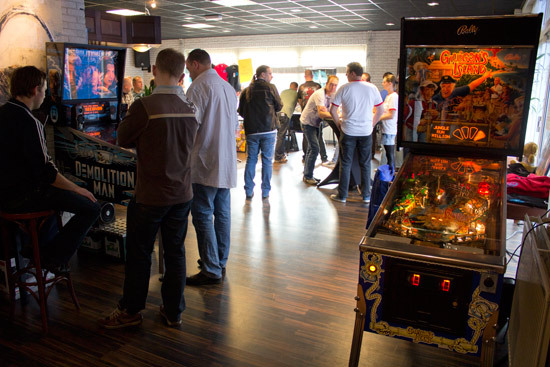 The venue was busy most of the time, making it somewhat crowded around the machines (and in the Classics Tournament area in particular), but the exterior area at least provided to opportunity to cool down and take a break from the action. 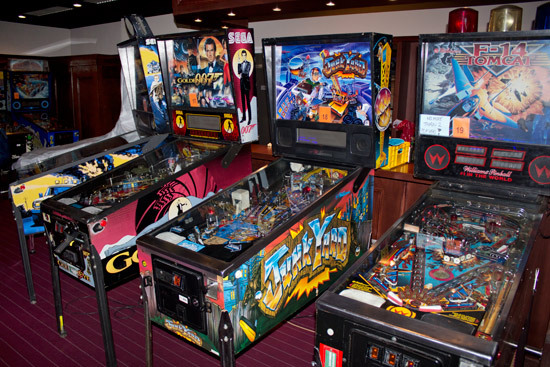 The machines in the free play area mostly held up well to two days of solid play. There were a couple of casualties in the DPO room and the Classics area, but the machine techs were quickly on the case and got them all working in the end. 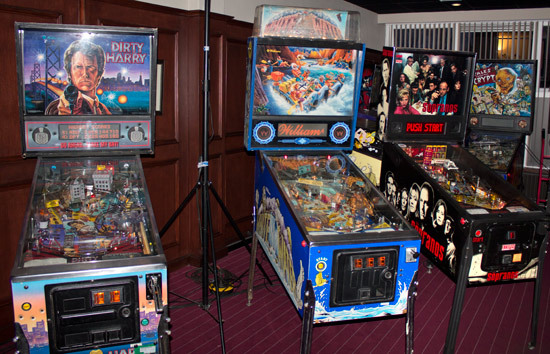 The DPO room was a little small for the number of machines and players, making it both crowded and hot at times. More information about the format and current standings in the Classic would also have been welcomed. Overall though, we all had a very enjoyable weekend and found some interesting and unusual machines to play out in the free play area. There are a lot of people involved in making an event like the DPO happen, and we thank them for all their hard work.